Freddie was inducted into the army in the spring of 1942, just a few months after Pearl Harbor. 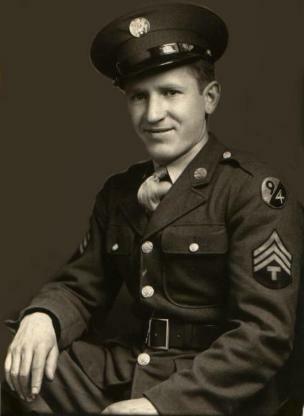 On March 19, 1942 he reported for duty to Fort Jackson, South Carolina for Basic Training. There he remained for two months, and then transferred to Fort George Meade in Maryland. While at Fort Meade he attended the Army's Cooks and Bakers school. Freddie was initially trained to be a cook, however fate would have other plans. His next stop would be the 94th Infantry Division at Camp Phillips in Kansas. The 94th Infantry Division was authorized to be organized in the Territory of Puerto Rico, in 1918. However the cessation of hostilities in November of 1918 cancelled plans for the division's activation. The division remained on paper until 1921 when it was constituted as an organized reserve unit. It was named the “Pilgrim Division” from the New England region it was assigned. The 94th’s original shoulder sleeve insignia was the silhouette of a pilgrim bearing a blunderbuss at right shoulder-arms. This insignia was redesigned for the division’s activation at the beginning of WWII, since the men would be drawn from throughout the country. The division’s regiments al had their own Antecedent histories from the first world war. The 301st Infantry regiment “From This Center Liberty Sprang” was originally organized at Fort Devens, Massachusetts a s part of the 76th Infantry Division. It’s personnel were drawn from the Boston area. The regiment sailed for France on July 6,1918 where it served as part of the 76th Depot Division furnishing troops to other units. Upon the completion of the war the regiment returned to Fort Devens where it was deactivated. In 1921 it was reconstituted as a reserve unit and assigned to the 94th Infantry Division. 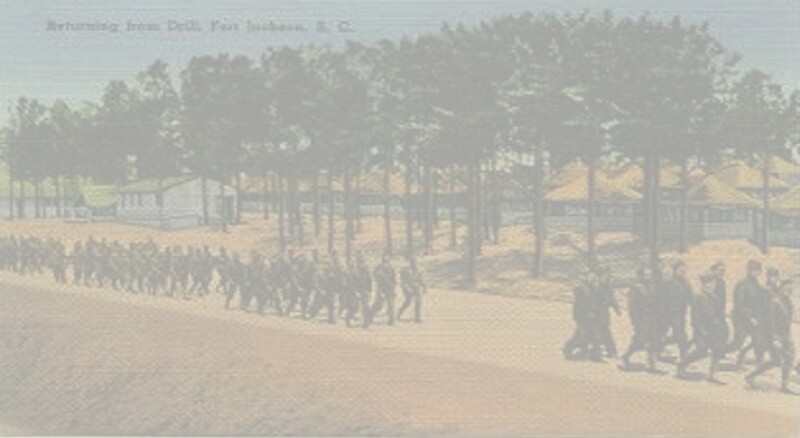 The 302nd Infantry Regiment “The Command is Forward” was organized at Fort Devens also in September of 1917 as part of the 76th Division. In July 1918 it sailed for France and like it’s sister regiment served as a replacement unit until the end of the war. Once the war was over the regiment returned to the U.S. and was deactivated. In 1921 the 302nd was assigned to the 94th Infantry division as part of the National Defense Act. The 376th Infantry Regiment “Don’t Tread On Me” was organized but saw no overseas service. It too was deactivated and assigned to the 94th Infantry in 1921. The 94th Division was activated at Fort Custer near Kalamazoo, MI on September 15, 1942. Major General Harry Maloney Commanding. Maloney was born on August 24,1889 at Lakemount, New York. He attended Yale University prior to entering the U.S. Military Academy in 1908. He Graduated in 1912 along with fellow classmates Generals Walton H. Walker and Troy S. Middleton. 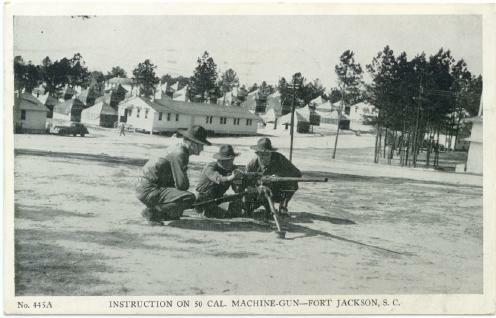 Originally the officer cadre came from the 77th Division then stationed at Fort Jackson, South Carolina. In November 1942 the 94th was moved to Camp Phillips, near Salina, Kansas because of inadequate facilities in Michigan. 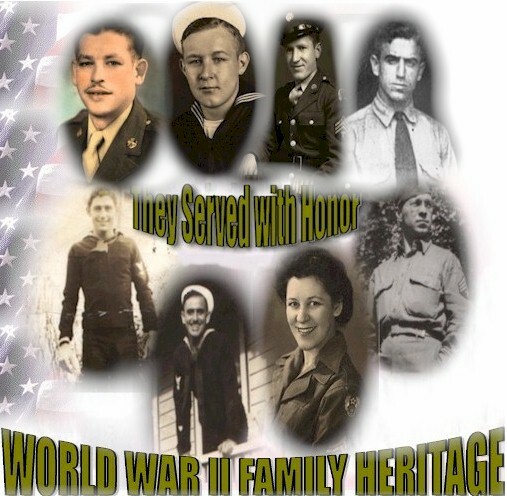 It was initially filled in with draftees and began basic training in December 1942. 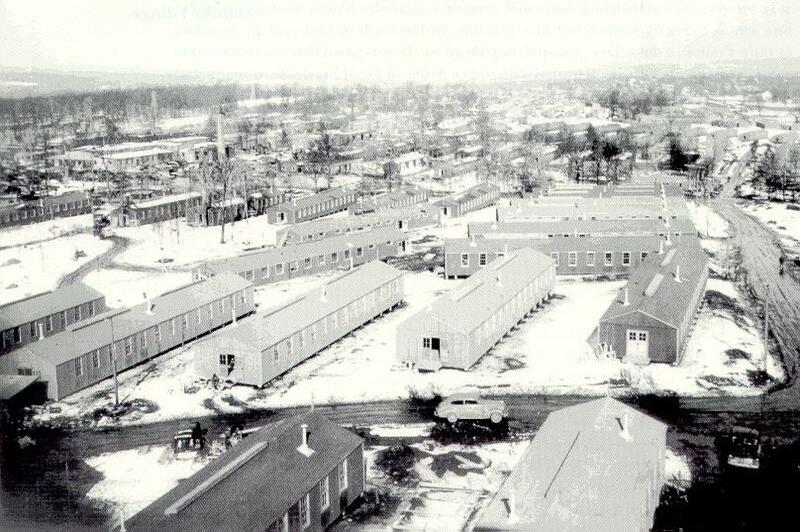 Camp Phillips was established in the latter part of 1942, and was the home of the 94th Infantry Division. The Camp was named in honor of Colonel William A. Phillips, one of the co-founders of the city of Salina, Kansas. The post was used as a training center and P.O.W. Camp until its closing in the fall of 1945. During World War II, the little village of Salina exploded and was the center of much activity while Camp Phillips was constructed, and then while serving as a training camp until the war's end in 1945. The "filler replacement" men of the 94th Division began arriving on December 5, 1942 at a rate of 1000 men per day. This continued until the end of the month. Then three days after Christmas, basic training began. The men trained from dawn until dusk during the short cold winter days. The winter of 42-43 was one of the most severe Kansas had ever experienced. Outside activities were conducted in sub-zero weather. Firing ranges were used in near-blizzard conditions. The spring bought torrential rains and mud, while the summer brought extreme heat and choking dust storms. The division trained under these conditions until late August 1943 at which time it moved to the Second Army's Maneuver Area in central Tennessee. The 94th division had a major set back when in September they were ordered to provide 1,500 overseas replacements for other divisions. The manpower drain in the Italian and Pacific campaigns were taking it’s toll. So, depleted, and demoralized the division moved into a temporary facility Camp Forrest and waited. 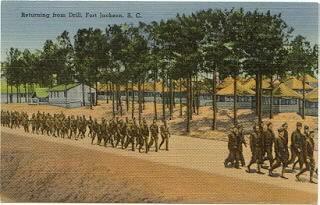 The 94th had to wait for the 84th Infantry Division’s departure from Camp McCain, Mississippi. Just when the 94th had adjusted to it's depleted ranks , orders came for the division and each regiment was ordered to provide an additional 300 men for the 8th Infantry Division as well as many items of serviceable combat equipment. The 8th Infantry was alerted for overseas movement to England. The 94th complied as there was a war on and meen were despeartely needed. Late in November the 94th moved by truck to it’s new home at Camp McCain, Mississippi. There Uncle Freddie would meet Marion Jereb who was in the same barracks and company as Freddie. U.S. Army Camp McCain was located near Grenada, Mississippi. Named for Brigadier General Henry P. McCain a First World War hero. 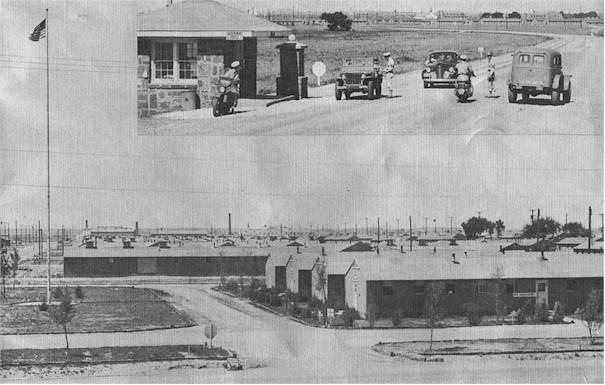 Camp McCain was now home to 94th division after arriving in late November 1943. Due to the severe manpower shortage the 94th was to remain at Camp McCain and continue it’s training. During the previous three months at Tennessee the 94th lost a large part of it's strength to other divisions and as replacements. The decision was made that the 94th would remain on hold in a training pattern until the Army figured out a way to bring it back up to strength. The high turnover rate for combat divisions was draining the Army of it's manpower. The manpower shortage was so severe that the draft was lowered to 18 years and extended to 40 years of age for able bodied men. In the Spring of 1944 General George C. Marshall the Army Chief of Staff requested to the Secretary of War, Henry M. Stimson the War Department shift 120,000 men from the Army Specialized Training Program (ASTP) This was approved and soon the 94th began getting replacements for the lost men. Even with this influx of new men the training would continue until the new personnel were incorporated into the division. While at Camp McCain the men learned advanced infantry tactics, familiarized themselves with their weapons and had the chance to earn the expert infantryman badge. It was at this time when fate would intervene for Uncle Freddie. Initially trained as a cook, he would volunteer to transfer to an infantry company. C Company to be exact and Uncle Freddie would learn to operate the 60mm mortar. He eventually became squad leader attaining the rank of Sergeant. On May 5th, 1944 the 94th received orders to prepare for overseas movement (POM). During this time the invasion of Europe had begun on D-Day June 6 1944. Freddie along with the rest of the 94th grew anxious as they prepared to deploy. 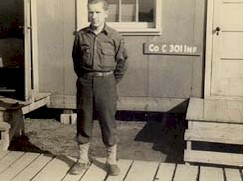 Uncle Freddie finally left Camp McCain along with the rest of the 94th Infantry Division on July 23, 1944. They left by passenger train to Camp Shanks, New Jersey, the 94th’s port of embarkation. The eight day train ride was cramped as well as uncomfortable, none of the passenger cars had air conditioning back then. The Trip made in the middle of summer was unbearable. They arrived in New Jersey on August 1, 1944. After a few days of sight seeing in New York City the Division was restricted to the base and began to prepare to board ship for the journey to England. The Division loaded on the Liner Queen Elizabeth for the crossing. Although this was a Luxury Liner it hardly looked it. 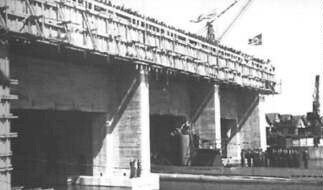 The QE was completed in 1940 after the war had started, so she never carried one passenger in peace time. She was immediately converted to a troop transport for the war effort. Completely fitted out with anti aircraft guns and the dark gray paint typical of Navy Ships. Each of the staterooms which normally would hold two people in twin beds now packed 15 soldiers to a room. The QE could carry 18,000 troops in one crossing. The division HQ set up it’s headquarters in the once prestigious Dining room the ship itself was divided into three parts Red, white, and blue sections each section had an orderly room and that is where the regimental HQ’s were set up. The QE left New York harbor at 0730 on August 6, 1944. Once underway the ship was escorted by Aircraft from the Coastal Command. The next day the Queen was on her own. For her protection the Queen had only her speed and the deck guns. He 301st Artillery battalion was selected as Draft gun battalion and practiced firing the deck guns with the supervision of the British. The seas were calm and without incident, the Queen Elizabeth made her Atlantic run in 5 days. She arrived in Greenock, Scotland on August 11, 1944. On the Morning of August 12th the troops of the 94th infantry division officially landed in the European Theatre of Operations (ETO). The men began debarking the great liner and went straight ashore to the trains awaiting them at Greenock. From Greenock the GI’s of the 94th traveled South. The men were not looking forward to another train ride, only this time the weather had cooled considerably due to the northern latitude and the ride was much more pleasant. With the debarkation completed the division moved to temporary location at Wiltshire County. The division Headquarters was established at Greenway Manor House at Chippenham the 301st was billeted in Trowbridge. Uncle Freddie's C company arrived in Erlestoke located in Southern England just north of the port of Southampton. The rest of the regiment and division were camped in small towns in an area that formed an irregular shaped triangle. While there at Erlestoke the company conducted more training and attended lectures from British veterans on many subjects including German battle tactics and how to escape if captured. This went on for several weeks while the 94th awaited assignment. While awaiting assignment the men did manage to do some sightseeing and visit some areas of southern England. On August 30th the division was placed on alert from HQ U.S. Ninth Army. On September 3rd the 94th received its orders and left Southern England. The 301st regiment, including Uncle Freddie's C Company loaded into two merchant ships the Crossbow and Neutralia. They departed on September 5th and sailed towards Normandy. NORTHERN FRANCE: The "Forgotten Front"